I need to get more guns in the house. Correction, guns that work instead of toy guns. These Zombie invasions scare me. Oh DARN IT! I saved the wrong quiz! Now I have to find the Zombie survival results somewhere?!?! 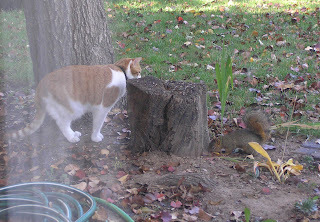 Squirrels, Squirrels, SQUIRRELS, and cats. It was squirrel day at the toy museum. 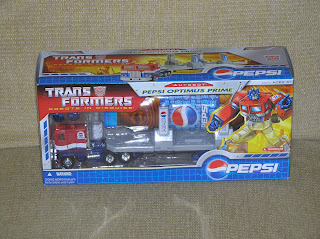 And I really hope they bring back that Optimus Prime toy, I really liked that one. 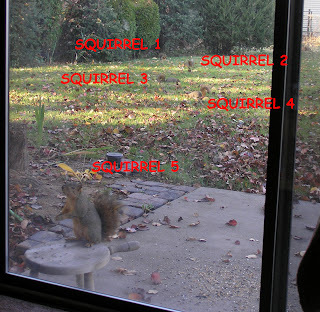 Aparently, Bart has some sort of Prime Directive with the squirrels. For goodness sakes, pounce Bart, POUNCE!!! 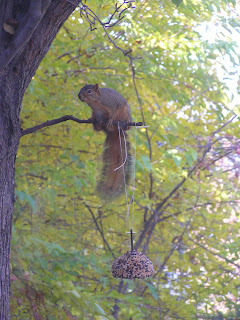 We put a food bell up in the tree for some squirrelific fun. 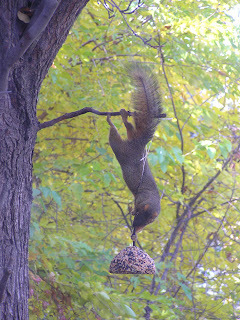 Sadly I didn't get the shot when the string broke and the bell and squirrel attached fell to the ground. I think it knocked the wind out of the squirrel because he was slow getting up. 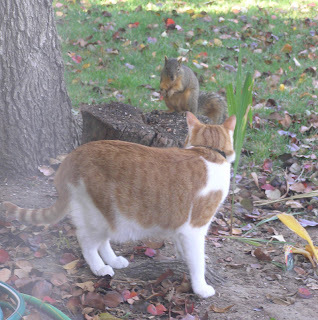 I believe it was Nostradamus who said that if four squirrels were to align, good things would follow. 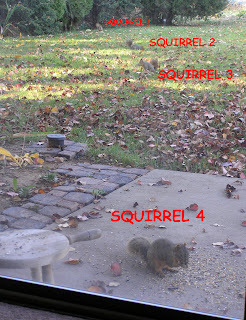 I wonder what would happen if five squirrels aligned? 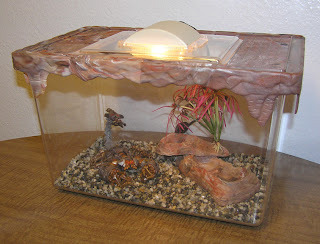 My old Flintstones Fun Aqarium! 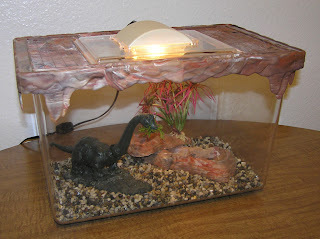 Unfortunatly its missing its base, and Flintstone's graphic, but everything else seems to be in place. 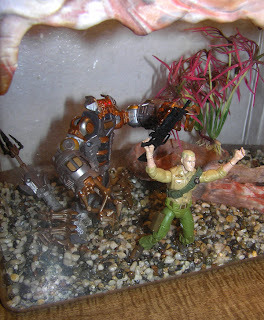 Ever Since Sparticus kicked the bucked, or I guess in a fishes case, got flushed out, I have been thinking about getting a new mini pet. 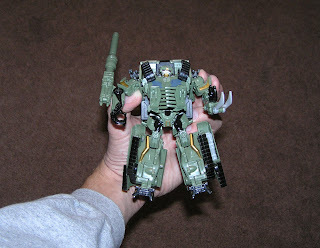 So I bought a Scorponok! He's a cute little dude with attributes like a 2 level intelligence, and an 8 level endurance. I was a bit sad that he didn't take to his new home right away. 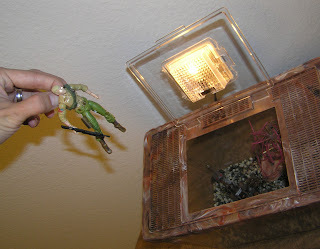 But when I tossed in a GI Joe, things got very interesting! 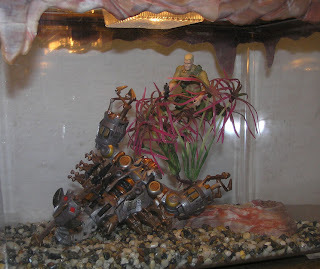 Their favorite game is for Duke to climb the tiny tree, while Scorponok tries to shake him down. I got tired of watching them and went to bed. We will have to check on them from time to time. 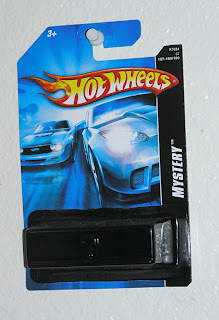 Hot Wheels Mystery Car Winner? Let the debate begin! Who won? I suggest you make your own drum roll effects while you watch the youtube. Thanks for playing all! And a big Whoopee-Doo-Da to the 400th post here at the Dan's Toy Museum! 1. Only one comment per person!!! 2. Pick a color, car type, and special feature. Thats three and only three things. 3. If there is a tie, whoever commented before is considered first. 4. If you make up a name for yourself, you better be reachable, or else! next in line gets your car. 5. I need 10 players! So ask your friends, family, dogs, whatever to post a comment guess. Well maybe not dogs, that breaks rule #4. 6. I will post a fantastic You Tube opening Mystery Hot Wheels party on say...Thursday or so, when all ten comments are in (which will be a monumentous day at the museum this being the 399 post and all). 7. If there is over 10 by then, great! Less odds to all! 8. And if there still ain't 10 by Thursdayish, I still do an opening and I get to keep the car. 9. Oh yeah one more thing, rumor has it there is a Batmobile in one of the mystery packages. Yeah--I call that one! 10. In the case of a Batmobile, which is MINE. I bought a spare Mystery Hot Wheels toy...just...in...case! GET YOUR FRIENDS TO VOTE NOW! #11. If there is some fluke of nature and a million comments come in. I will only go with the first 50. Im not going to even try and pick a winner out of a million. FOR THE HONOR OF 400 POSTS AT THE TOY MUSEUM! THIS CAR COULD BE YOURS! #12. I hope this isn't illegal. Check out Firefly's shadow arm weapon! 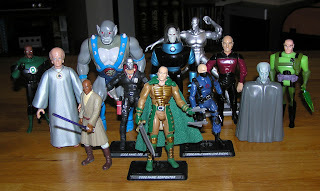 This weeks toy addiction swings violently back to GI Joe. Talk about roller coasters of collecting of late. One minute I can't stop looking for GI Joes, the next minute I could care less and I'm on to hunting for the Justice League figures, and with a whim of wind I'm powering back to Transformers with a vengence. This is getting silly. I wish I was one of those collectors who can draw the line with one topic and stay on that topic. I'm sure I would have a better collection of one thing, then flip flopping all over the place. Anyhow. This new Polly action figure has it all. THis time around the plastic is softer so hopefully his feet won't break off on first perchings. 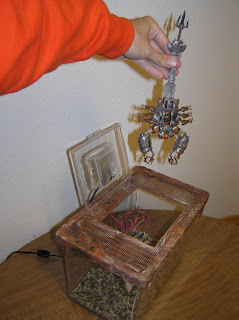 He comes with a large companion figure, Shipwreck to hold him off the ground. I was a little disappointed that they jointed the accessory Shipwreck more so than Polly. It would be nice to have some jointed wings, maybe a few electronic sayings, and some detachable feathers. Maybe on the 50th anniversary figs. 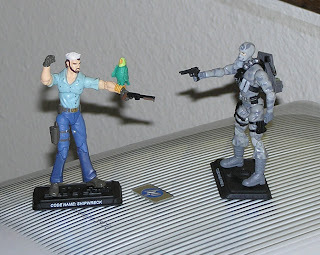 I never owned a Firefly figure in grey camo with exception of the other Firefly figure I own in grey camo. But that one is still in its package with a repaint Serpentor and that one Viper with the text that runs across his eye gaurd. I can't decide if I should open it or not, probalby not since I already have that new Serpentor. With the way these new Joes are flying of the shelves here, I almost feel guilty opening them. I missed out on the Red Ninja, Stalker, Beach Head, and some Cobra Officers thinking they would stay on the shelves a few exta days. I didn't want to buy the whole bunch in one day... I do have limits to my geekiness. It did happen to me! 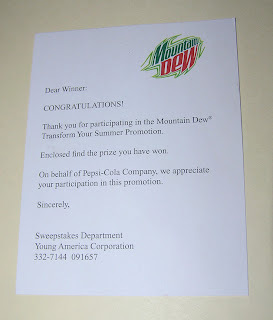 This almost makes up for that lame-o Life Savers Thundercats poster contest prize. I almost wonder if Hot Wheels is Jumping the Shark with this line of 'Mystery Cars.' I want to open it soo bad, but if I do the mystery will be replaced with, I spent a dollar on that piece of crap?!! I should have a contest in which every one guess's a color, car type, and a special feature. Who ever comes closest wins the car, and I will send it too them via wonderful UPS. If I get over ten responces to this, I will highly consider that deal. 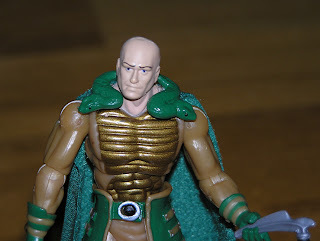 Hey-Hey its Serpentor! Is that lyrics to a song? I kind of like the new version, Very warrior like. 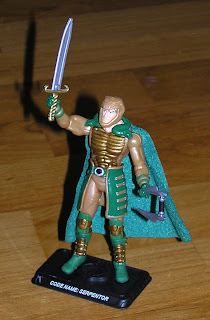 As long as Serpentor doesn't take too much of Cobra Commander's spot light, I don't mind having him around. Without his helmet, he seems sad though. Its either the eyebrows or the sad frown. Maybe its his missing hair? Luckily, I have just the right group of toys to help cheer him up. 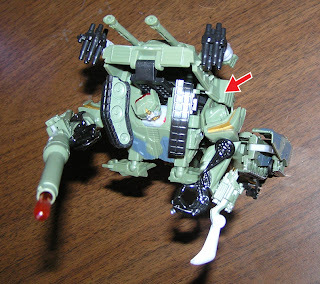 I took an Exact-o blade to the little pegs that don't fit into his shoulders. Just lightly trimmed the sides. The pegs fit now, they just wont stay. Then I noticed that when you keep the tourret side flaps down over the attachment, it pressure holds it in place. Yeah, now I can play with Brawl with less of a chip on his shoulder! 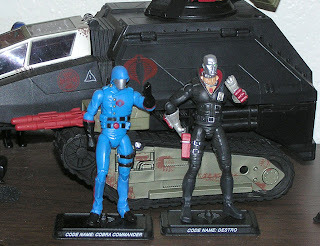 Cobra Commander and Destro, fists in the air! Could they at least had their fists alternated so they didn't look like they were mocking each other when standing next to one another? In about a week the Transformers score will finally be released. This has been a real slow year for good movie scores. Usaully by this time I have at least five or six from the current year. So far this year, its a big fat zero. Maybe I have heard it all, and am tired of what is released, maybe too many movies skip the background music for artistic comps, maybe composers use too much of their same stuff over and over again and it sounds the same, maybe John Williams has been on too long of a vacation, maybe A list composers are being dropped for cheap do what I tell you composers that the directors and editiors can walk all over, maybe its just a dry spell. I saw Transformers three times in the theatre, and its score sounded fairly decent. It will be interesting to hear if it translates by itself or not. I have heard lots of talk of how great the Autobots coming to Earth theme was, however I thought it sounded kind of bland. Same with Primes theme, needed more punch. I mainly like the repetitive sound of the Decepticon's are coming theme with the low chanting chorus. Most likely as always the stuff I like will be about one to two minutes in length while tracks of horribleness like "Sam at the lake" will be fifteen minutes long (and that I remembered was awful awful music. 1. Tomorrow Never Dies (David Arnold) Most listened to score ever. 2. Batman (Danny Elfman) Best Super Hero score ever. 3. The Rocketeer (James Horner) Where Horner steals his Titanic Music from himself. 4. The Empire Strikes Back (John Williams) Battle of Hoth, too cool. 5. Indiana Jones Last Crusade (John WIlliams) Belly of the Steel Beast...Wow! 6. Jurassic Park: the Lost World (John Williams) All about the Bongos. 7. Gladiator (Hans Zimmer)Loud, Harsh, Mars-ish, Fantastic. 8. Chicken Run (Powel and Gregson Williams) Chickens and Kazoos, oh yeah! 9. Cutthroat Island (John Debney) Ye-Arrg Matey Swashbuckle this! 10. Goldzilla (David Arnold) Sooo much action music my ears!